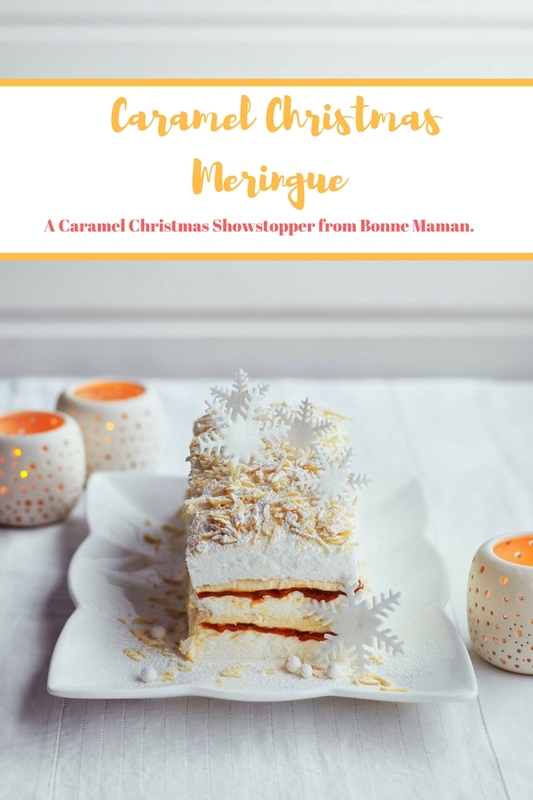 A Caramel Christmas Showstopper From Bonne Maman. Fancy making a Caramel Christmas Showstopper? Are you bored of the same old Christmas pudding and mince pies every year? If so, why not try this Caramel Christmas Meringue recipe out? 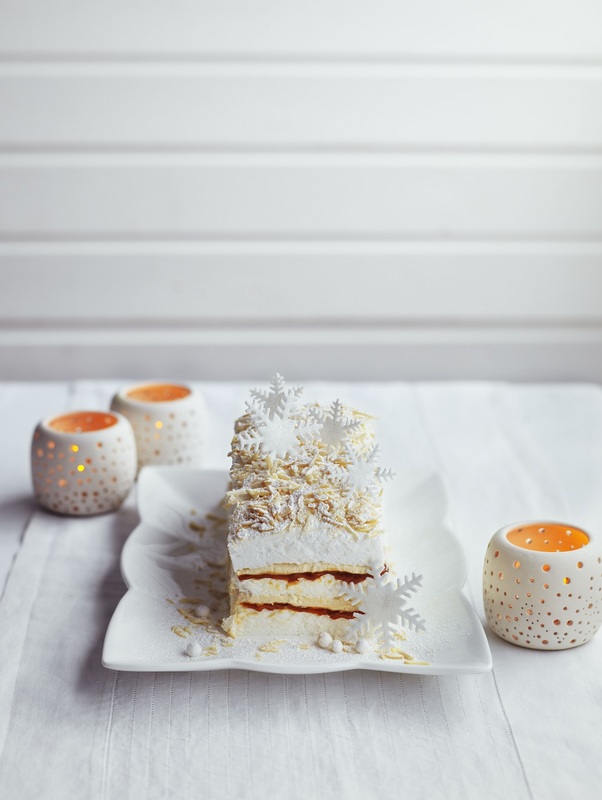 Bonne Maman introduces a fantastic alternative – a soft, mallowy meringue layered with caramel and caramel cream then frosted with toasted almonds and icing sugar – a delicious and super pretty festive dessert to wow your dinner guests this festive season. 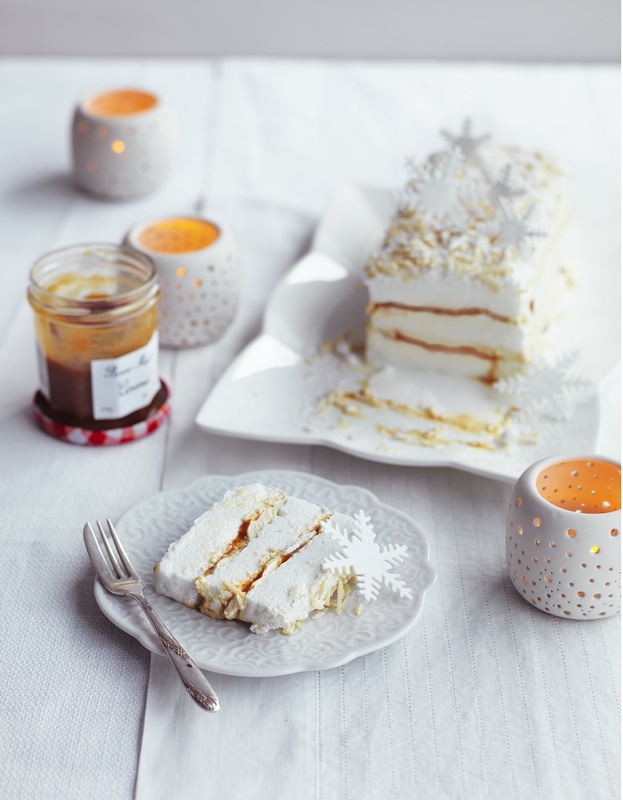 Bonne Maman’s ‘Caramel Christmas Meringue’ is a wonderful showcase for the French specialist conserves brand’s new Salted Caramel, a deliciously rich caramel, lightly seasoned with Guérande sea salt from the North Western coast of France. For a deeper, more intense caramel taste this winter wonderland showstopper works equally well with Bonne Maman’s new Hazelnut Praline Caramel. Whip the cream until it just holds its shape and folds in half the caramel. Keep whisking slowly for a few more seconds until the cream is just firm enough to spread. Cut the square into 3 lengths, each roughly 7.5cm x 22.5cm. Using a palette knife, lift one length of meringue onto a serving platter and spread with about a third of the cream. Drizzle with half the remaining caramel and place the second length of meringue on top and spread again with cream. Drizzle with the remaining caramel and top with the final meringue. The assembled Caramel Christmas Meringue, without the almond decoration, will freeze for up to 1 month – meaning you can play the perfect host knowing dessert is under control, simply thaw in the fridge for 2 hours before serving. Bonne Maman Salted Caramel and Hazelnut Praline Caramel are now available nationally from Sainsbury’s, Waitrose, Tesco and Morrisons as well as Ocado, Amazon and independent fine food stores. Salted Caramel £2.19 rrp and Hazelnut Praline Caramel £2.39 for 220gm jar. How To Make A Banana Split Cake: A Showstopping Cake Recipe. Neapolitan Style Drip Cake: Showstopping Cakes. Rhubarb And Raspberry Rainbow Meringue. BerryWorld Hazelnut Meringue Layer Cake With Strawberries And Raspberries. BerryWorld Cranberry Meringue Roulade With Cointreau Orange Cream. "Make The Most Of Sloe Berry Season With Hayman’s Gin"
"10/11/2017 Welcome To The Weekend Blog Hop"
You are right, it IS a showstopper dessert. It looks fantastic. Very pretty – I bet it's delicious! I would certainly enjoy a big slice of this since I do not cook anymore. I am NOT waiting for the holidays – we're having this tomorrow evening (we'd have it this evening, but I have to do a little shopping for some of the ingredients! ).I'm already dreaming about eating half of it in one serving!I found your blog via Beverly's Pink Saturday Blog Hop – thanks so much for sharing! How pretty! Thanks for sharing at Home Sweet Home. This looks like it came down from the skies so ethereal and pretty! What a beautiful cake and it look so yummy! Absolutely beautiful – and it looks so yummy! Thanks for sharing at the What's for Dinner party!